Тюнинг-ателье G-Power, специализирующееся на моделях BMW, представило свой новй проект на базе купе M850i. Модель стала мощнее и симпатичней после тюнинга. 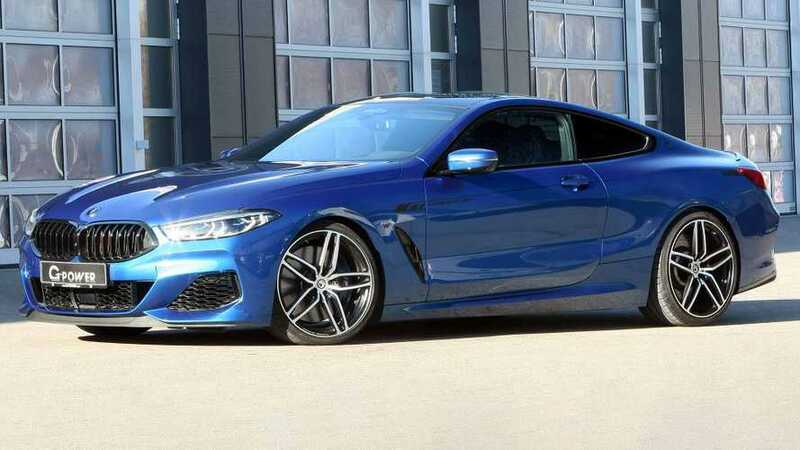 Нового спорткара BMW M8 пока нет и тем, кому не терпится получит самую мощную 8 Series уже сейчас, можно рекомендовать покупку M850i и последующее обращение в тюнинг-ателье G-Power. Специалисты, которые собаку съели на доработках BMW, готовы предложить увеличение мощности 4,4-литрового турбированного V8 с заводских 523 л.с. до 661 л.с. А это может быть даже выше, чем отдача грядущего BMW M8. После всех доработок BMW M850i с места до 100 км/ч разгоняется за 3,1 секунды и развивает 320 км/ч максимальной скорости. Для сравнения, базовое купе тратит 3,7 секунды на разгон 0-100 км/ч и имеет 250 км/ч максимальной скорости, принудительно ограниченной электроникой. За обновление программного обеспечения двигателя в G-Power с вас попросят €2 481, ещё €4 155 придётся отдать за новую выхлопную скорость, а снятие лимитатора максимальной скорости обойдётся в дополнительные €500. Помимо тюнинга двигателя у G-Power можно купить фирменные 21-дюймовые колёса по цене €7 521 за комплект. Ожидается, что уже в 2019 году BMW покажет серийное купе M8. По прогнозам, 4,4-литровый V8 будет выдавать как минимум 600 л.с., на уровне нового седана BMW M5, а то и свыше 617 л.с. у BMW M5 Competition. В свою очередь, версия BMW M8 Competition должна иметь под капотом порядка 630 л.с. The BMW 6 Series has become history – at least in its traditional form as the coupé, or the more recent convertible and Gran Coupé forms too. But of course, these models aren’t disappearing completely from the range. On the contrary, BMW is returning to an equally prestigious name for its successor: the 8 Series. The G-POWER company, from Peutenhausen in Upper Bavaria, has been specializing in performance optimizations on BMW models for more than 35 years and has now got involved with the most powerful 8 Series model to date: the M850i. 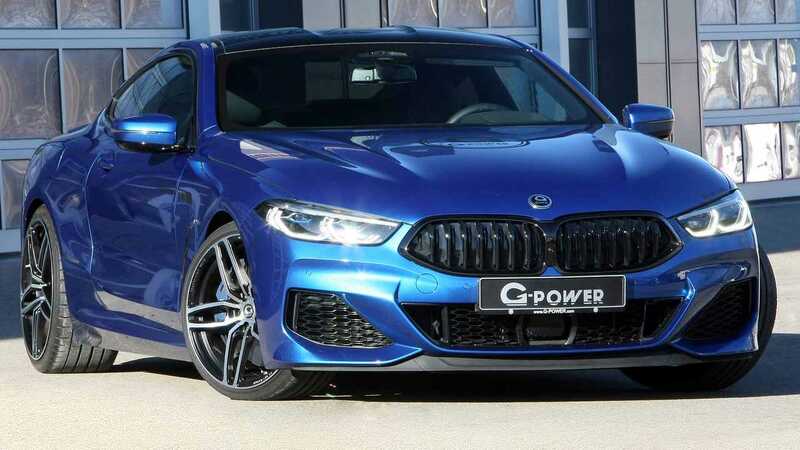 The result is, as usual, a significantly higher performance in comparison to the rest of the series, which helps bring the G-POWER M850i xDrive to a driving performance style worthy of super sports cars. The large 4.4 liter twin-turbo V8 in the front of the G-POWER M850i xDrive generates an impressive 670 HP (493 kW) and a maximum torque of 890 Nm. This is a boost of 140 HP (103 kW) and 140 Nm in comparison to the rest of the series. Responsible for this is a combination of hardware and software modifications. For one thing, G-POWER has installed a set of stainless- steel downpipes including 200-cell sports catalytic converters. These reduce both the thermal load and the dynamic pressure, allowing the twin-charged V8 engine to exhale more freely, thereby generating the basis for an even higher performance output for the sporty coupé. This new potential of the M850i Is than directly transferred into more output by the time-tested V2 Performance Software, supported by its perfect match, the increase of the top-speed limit, which can be optionally obtained. This means the G-POWER M850i can reach speeds of more than 320 km/h. In doing so, it completes the sprint from 0 to 100 km/h in a mere 3.1 seconds! Because the factory-installed engine protection and diagnostic features remain unchanged, the eight cylinders of the N63 are guaranteed to not be affected by the software changes. After all, G-POWER sets the safety and longevity of the technical components as its top priority in all developments and carries out extensive testing, both in hot and cold conditions. In addition to the technical optimizations, the M850i also shows off a set of the popular HURRICANE RR forged rims. The lightweight wheels are distinguished by their five classic double spokes and have dimensions of 9x21” and 10.5x21” here. They are fitted with high-performance 255/30R21 and 305/25R21 tires. The price of the complete wheel set starts at 7,521 euros. Fastest Sedan with the 750hp G-POWER M5 HURRICANE RS on the ATP high-speed oval in Papenburg with a measured top speed of 367.4 km/h.